Your shower has low water pressure. How do you increase the water pressure or make the shower head increase water flow? Well this question is asked many times by people with low water pressure in their homes. There can be many reasons your shower head is not spraying out high water flow. If the rest of the shower heads and water faucets in your home work as needed, then the problem is with the shower head or your bathtub showers water plumbing lines. If your home has low water pressure, then you will need a special “low pressure – high spray shower head” that is made to increase the water pressure spray. Most of the time people buy a new shower head to improve the look of their bathroom not knowing that the shower head they purchased is a water saver showerhead. Inside the shower head is a plastic or rubber washer that restricts the water pressure and causes it to be less than adequate. If you have recently installed a new shower head, remove it and look into the threaded tube to see if there is a water saving device installed. If so, you can make the hole in the washer bigger by using a drill or completely remove it using a screwdriver. Once removed or made bigger, install it back on the shower and test to see if the water pressure has improved. If unsure how to do this, do a search online for “how to remove the flow regulator in your shower head”. Doing this procedure will increase the water flow rate thus seeming to increase the water pressure. 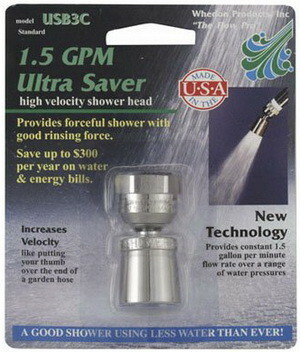 The easiest solution is to completely replace your shower head with a low GPM water saving shower head. Older shower heads have a high flow-rate, which passes a larger amount of water through a larger shower head at a lower PSI. A smaller water saver shower head has smaller water spray holes. When you have the same amount of water flowing through a smaller hole, the pressure increases much like when you put your thumb over the opening of a garden hose. Another cause of low water pressure in your shower is that the shower head is coated with hard water deposits. Sometimes the inside of the shower head will have a build up of hard water deposits thus it is unable to spray water out at the normal water flow. To fix this issue, you need to remove the shower head and soak it in a bowl of CLR, vinegar, or Lime-Away overnight. Here is a full tutorial on cleaning your shower head. NOTE: In the United States shower heads are required by regulation to restrict water flow to save water. The law says they must deliver less than 2.5 gallons per minute. Because of this reason, some showerheads will deliver less than an ideal water flow or water pressure. To increase the water pressure in your home you can adjust the pressure reducing valve (PRV). This will increase the water pressure which increases the PSI within your home’s plumbing pipes. Please understand that if you increase the water pressure too high by adjusting your PRV, you can burst water pipes and make your dishwasher and water heater malfunction. So if you will be adjusting your homes pressure valve, please use extreme caution. Your home appliances need below 75 psi to operate normally so adjust the valve accordingly. I tried the drilling out idea in my handheld, works so much better now, tons of pressure, great idea! Low water pressure has become a big concern now a days and well, You describe the good details for increasing low water pressure. I just redid my master bathroom. I have well water with low water pressure throughout the house. I thought that replacing the values and some of the pipes would increase the water pressure. This was not the case. I then went down to Lowes and Home Depot in search of a shower head that would fix my problem. I have tried everything I could buy. Nothing, I mean nothing worked. I then began running searches through Google.com , bing.com, yahoo.com for low water pressure shower heads and the best shower heads for low water pressure. I came across Take A Shower LLC. They have a series of shower heads and Handhelds called the Fire Hydrant Series Shower Head. I tried the Fire Hydrant Spa Plaza Massager, Fire Hydrant Spa Economy, and Fire Hydrant Spa Symphony 4 Jet shower heads. They are all amazing! I ended up keeping them all and now you can get an amazing shower in all my bathrooms. Next post: 50 Homemade Easter Decorating Ideas – DIY Decorations!